The chain store game is a simple game in extensive form which produces an inconsistency between game theoretical reasoning and plausible human behavior. Well-informed players must be expected to disobey game theoretical recommendations. The chain store paradox throws new light on the well-known difficulties arising in connection with finite repetitions of the prisoners’ dilemma game. Whereas these difficulties can be resolved by the assumption of secondary utilities arising in the course of playing the game, a similar approach to the chain store paradox is less satisfactory. It is argued that the explanation of the paradox requires a limited rationality view of human decision behavior. 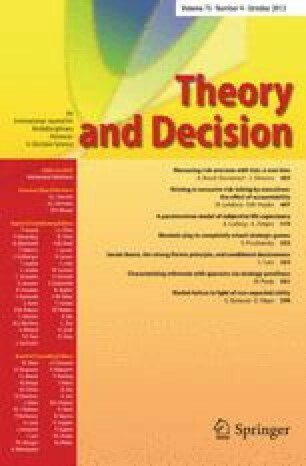 For this purpose a three-level theory of decision making is developed, where decisions can be made on different levels of rationality. This theory explains why insight into the rational solution of a decision problem does not necessarily mean that the corresponding course of action will be taken.